Benn hunting Anchorites and basilisks off and on for 2 levels and I have yet to see this mob spawn in JP. Any other known habitats? Found him in the gnoll caves, in the first room after you turn right. They have significantly less HP's as casters, and can be taken down solo by 50+'s easily with stuns. 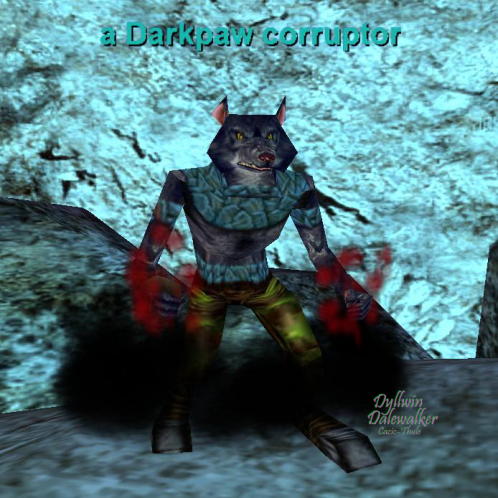 The only caveat is that Darkpaw Warriors spawn and/or have wide aggro, and will come to help. Try and get the casters to follow you to a safe pull point. I like the tunnel (get nearer to the forest than the darkpaws). The loot was usualy around 3-4pp and a scroll for these. They can land some heavy hitting spells, so STUN and disrupt as much as possible.